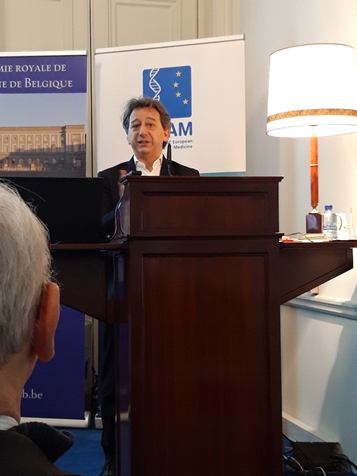 The FEAM Forum Annual Lecture – held in Brussels on March 18th 2019 – was a great opportunity to understand which are the effective advantages and the challenges coming with the use of the AI in healthcare. At the question “Is Europe ready?”, the answer was clear: “Not there yet!”. During the event, many aspects from different perspectives have been addressed such as the issue of the risk assessment, validity and transparency of the data generated by the AI, data security for privacy, the opportunity to use AI for prediction and diagnoses and much more along this. A detailed summary report will also be soon available on our webpage. FEAM wants to thank all participants and speakers for their excellent talks. Thank you to Pr. Andrea Renda, Prof. Gustave Moonen, Dr. Nicola Perrin, Dr. Marco Marsella, Dr. Martha De Cunha Maluf-Burgman, Dr. Stefan Platz, Prof. George Griffin, Prof. Jean-Michel Foidart and Ms. Jacki Davis (moderator) for the lively discussion.